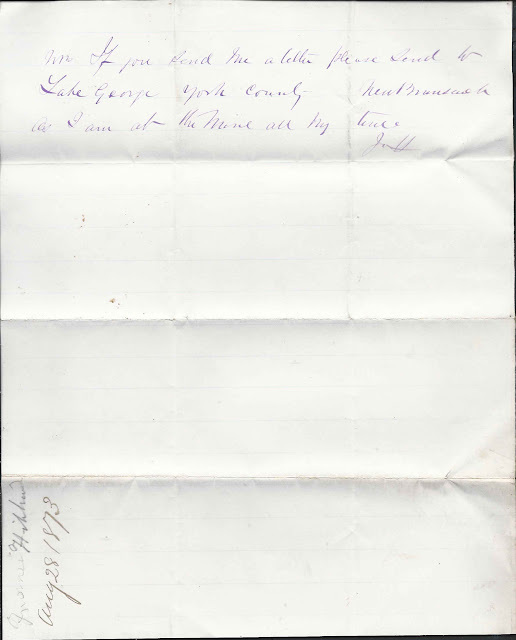 Letter mailed on August 28, 1873 from Hon. 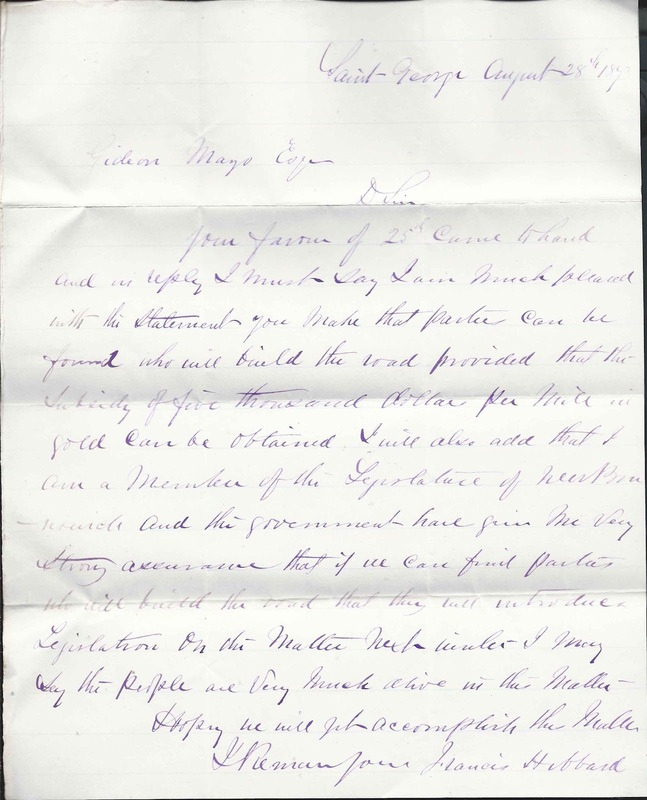 Francis Hibbard at St. George, New Brunswick, Canada, to Gideon Mayo, likely at Orono, Maine. 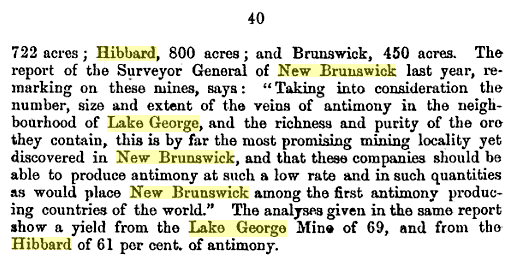 The letter concerns the possible construction of a road or a rail bed, possibly a spur line to Hibbard's mine at Lake George, near Harvey, New Brunswick. 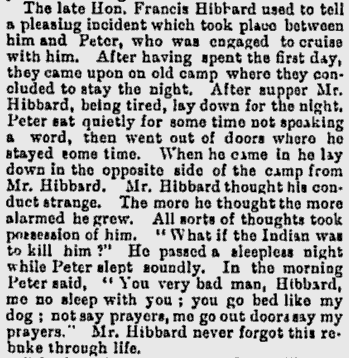 Francis Hibbard was born about 1811 at Halifax, Nova Scotia, son of Robert and Ellen (Bampton) Hibbard. 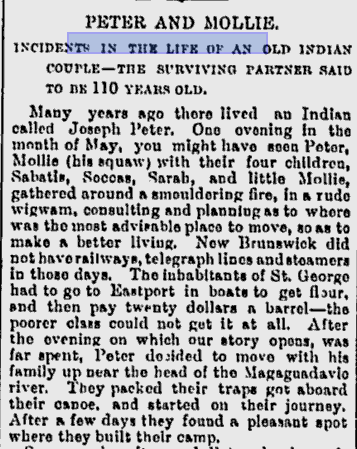 One online reference indicated that his parents had come from Maine. Clarissa Christopher, whom he married at St. George, on 25 May 1837. Witnesses were Louis B. Messinett and G. W. Gilmor; Rector Samuel Thomson performed the ceremony. Urania Gillmor, daughter of Daniel and Pamelia (Dowdle) Gillmor. Francis had children with each wife, possibly eleven in all. He had lumbering, mining and railway interests and served in the New Brunswick legislature. Click here to see the house that Hon. Francis Hibbard had built for his family in 1860. Francis died in November 1880. See an earlier post that features a letter written by David Knowlton of D. Knowlton & Co., of Camden, Maine, also written in 1873 to Gideon Mayo and also about a road. 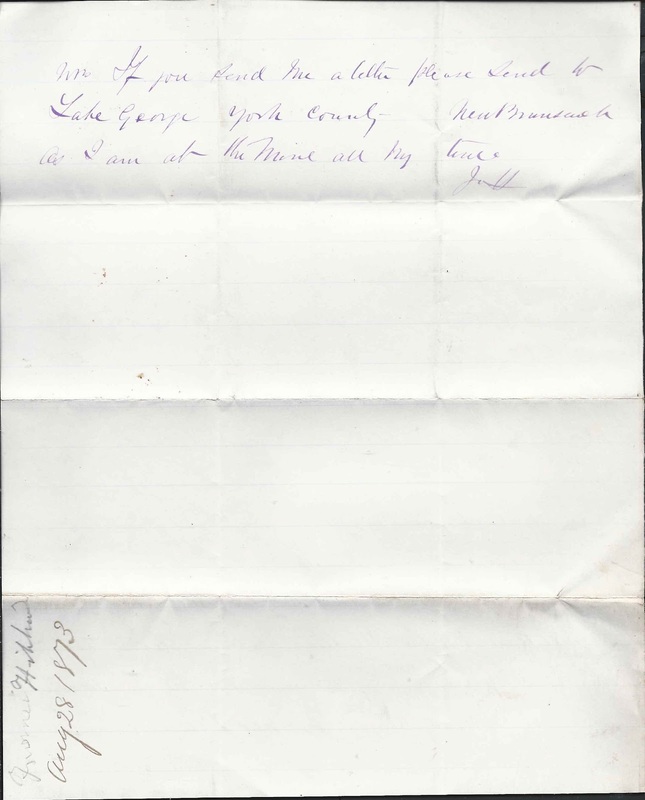 Colonel Gideon Mayo was born in Frankfort, Maine, in 1808, the son of Ebenezer and Mary (Wilkinson) Mayo, and died in Orono, Maine, in 1876. His honorific came from service in the Maine Militia. He served in the Maine Legislature in 1859 and 1864 and was involved in the lumbering, farming and railroad business. In 1832, he married Martha Houston, daughter of Joseph and Hannah (Brown) Houston. Their children were: Elbridge C.; Hannah M.; Edward P.; William Franklin; Gideon; Charles; Abbie Anna; Henry Allen (died in infancy); Henry Allen; Annie M. (who married Prof. George Hamlin); and Joseph H.
The Raymond H. Fogler Library at the University of Maine has an archive of Gideon Mayo papers. If you have corrections to the information above or more information on Hon. Francis Hibbard or Col. Gideon Mayo, please leave a comment or contact me directly. Pam, enjoyed your presentation last evening. Happy to return solid info for interested parties. The Hibbard House" referenced above is on the Historical Walking Tour of St George, NB (#20) - was right across the street from my uncle & aunt. Of direct importance, the Senator Gillmor House is (#12) on the tour and is still owned by Dan Gillmor and his wife - they have a gift shop there (the home is on Main St and is for sale, if a Hibbard or Gillmor family would like to preserve. The caption on the Senator Gillmor House reads: "8 Main St, Arthur Hill Gillmor (1824-1903) was a lumber baron and Senator of the Dominion of Canada. He had the house built for his wife, Hannah Dawes Howe from Bristol, ME, as a wedding gift circa 1846." Walking Tours are available May thru Sep from the Tourist Bureau is: "The Tourist Bureau is now located at Granite Town Farms at 151 Brunswick Street and is open daily during the summer months from May to September 30. Call 755-6314". The rootsweb site is one of the best I've seen anywhere: http://www.rootsweb.ancestry.com/~nbpstgeo/ From this link enter "Hibbard" in the "Find" box and you will get 38 direct hits of vitals and history. Thanks, Jim! Must put the Hibbard House on my itinerary for next year. And it was nice to see the Bristol, Maine, connection; would love to know how they met. Interesting read, thank you for sharing.I'm just starting the journey of finding out our family history with my 82 year old father- Michael Gillmor. His grandfather was Frank H. (for Hibbard) Gillmor. I believe his aunt would've been Urania. Anyway,I would love to take my dad on a trip to New Brunswick soon to visit these historic places.Thanks again! Hope you get to take that trip with your father - sounds as though it will be a wonderful memory for you both.